It is exactly two weeks until Def Leppard begin their VIVA Hysteria! residency in Las Vegas. The VIVA Hysteria! residency will consist of 11 shows at The Joint at the Hard Rock Hotel where the band will perform the 'Hysteria' album in its entirety. The first show is now just 14 days away and kicks off on 22nd March. 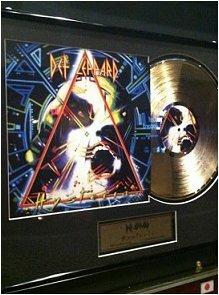 The venue have been given more than 45 Def Leppard album/single awards which will be displayed during the run of shows. You can view a photo of these on their facebook page. "Over 45 awards, records and plaques are now on displayed across from The Joint at Hard Rock Hotel & Casino to commemorate Def Leppard's residency beginning March 22nd! The display includes accolades for "Hysteria" which is part of an elite group of albums in music history to achieve RIAA diamond certification."